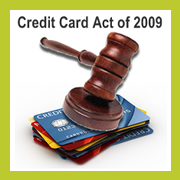 The New Credit Card Act of 2009 takes effect on February 22, 2010. To help you prepare, my blog will feature Nine Tips over the next three weeks. You credit card company will have to give you 45 days notice before they increase your balance with a retroactive credit card interest rate. This gives you time to transfer the balance or pay it off. Beware: They don’t have to give you notice if you agreed to pay the balance within a set time period on a promotional offer. It also doesn’t apply if your account is past due. Does it ever feel like your credit card bill is due the same day it arrives in the mail? That’s changing with the Credit Card Act of 2009. Creditors will now have to mail your bill 21 days before the due date. 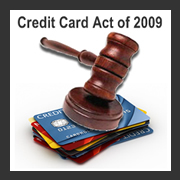 The New Credit Card Act of 2009 takes effect on February 22, 2010 To help you prepare, my blog will feature Nine Tips over the next three weeks. Do you ever wonder why it takes so long to pay off your credit card balance? It’s partly because creditors apply your credit card payment to the lowest interest rate balance first. Here’s an example: Let’s say you took a zero percent balance transfer offer. Then, you made some new purchases on that card. In the past, your payment would go to the balance transfer amount first until that’s paid off, while you’re interest rates pile up on those clothes you bought 6 months ago. That allowed the credit card company to make the most interest it possibly could possible off your purchase. Well, no more. 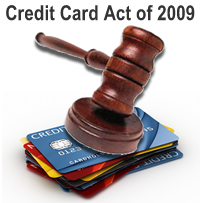 The Credit Card Act of 2009 will require creditors to apply your payment to the highest interest rate balance first. How do you handle your credit card payments? Do you pay the balance very month, or do you only pay the minimum? Your bill will now include a section that tells you how many months it will take to pay off your credit card balance if you make only minimum payments. That will be an eye opener for some of us. Have you ever received a credit card bill with a Sunday due date? Were you charged a late fee if they didn’t process the payment until Monday? That’s changing with the new Credit card Act of 2009. Your payment won’t be marked as late if it’s due on a weekend or holiday, but posted by the next business day. If you had trouble getting a new credit card before, it may be harder now. With the new Credit Card Act of 2009, you will have to disclose your income and your ability to repay the balance up to your credit limit. In the past, you wouldn’t know if a purchase put you over your credit limit until you received a big fee on credit card statement. But that’s changed. Now, if a purchase will put you over your climit, your purchase will be declined. With the new Credit Card Act of 2009, only pre-authorized purchases will be approved. Have you ever gone out of town and arrived back home to find out that you have a credit card payment due tomorrow? Like most people, you probably got on the phone, or online, to make the payment because you wanted to pay right away You also probably got charged a nice little fee for not sending a check through the postal service like a good little credit card owner. With the new Credit Card Act of 2009, you will not be charged a fee to pay your credit card, unless you specifically ask to have your payment expedited (which means that you asked to have it rushed through). Twenty-one is the new minimum age to apply for a credit card according to the Credit Card Act of 2009. Have you heard about the new credit card rules? Credit card companies must give you more time to review statements and rate changes, which helps you make better decisions when dealing with debt. Statements must now be mailed at least 21 days before the due date. Credit card companies make a good profit from late fees and rate increases. To increase the amount of late payments, they began billing closer to the payment due date, sometimes forcing you to pay within a week. This allowed them to add fees and raise rates based on payment history. The new rule allows you a standard billing cycle to review your statement and remit payment. Second, creditors must now notify you within 45 days of a rate change. This is better than the previous 15 days notice. The rule change gives you a chance to accept or decline the offer, and gives you time to shop for a new credit card company. The rest of the Credit Card Act will go into effect next year, hopefully with more consumer protections. Remember: if you owe creditors a balance that can’t be paid in full each month, you give them power over your financial health.